Slieve Felim / Sliabh Eibhlinne is the name of a range. Nowadays the name it is often used to refer just to those hills south of the Newport-Rear Cross road, but it once denoted a much larger area. John O'Donovan described as stretching north to Silvermines and east to Dundrum. 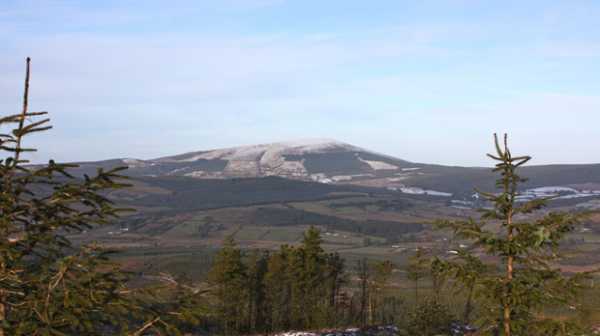 This means that it included Keeper Hill, Mauherslieve and the Silver Mine Mountains. The earliest reference to this name is in the Annals of Inisfallen, 531 A.D., 'Bellum Eblinne'. The female name Eibhlinn (the name of a goddess) seems to have been confused with the male name Feidhlim, perhaps because Eibhlinn is not used as a name in modern Irish, and Feidhlim was more familiar. Feidhlim was the name of three early kings of Munster. Previously Sliabh Eibhlinne as principal name in MV. Slieve Felim is the 815th highest place in Ireland. Picture from csd : The view north over to Keeper Hill. Picture: The view north over to Keeper Hill. I parked in roughly the same spot as oldsoldier - just be aware that the stone peirs look like the entrance to a private driveway, so don't be put off driving on up! I did Cullaun first, and then took the obvious route down to the col between Cullaun and Slieve Felim, then up to Felim using the forest ride. I had the good fortune of frozen ground, but the ride looks like a pretty good place to go bog snorkling in more typical Irish weather. The summit itself isn't really marked with much, being the highest point on the ride/track. Nice views over to Keeper Hill, but Sleive Felim South Top has nicer views south.